Today I had a conversation with a friend who is dealing with some poor performance at work. As we sat down with cigars, he posed the question that drives this post. How do you deal with poor performance at work? I think we can all agree that each of us is wired differently. Managing staff would be so much easier if everyone worked just like I did. But that’s never the case. And so, it can be frustrating to see someone who looks like they’re not pulling their weight – because you just don’t get it. Like they’d say in Princess Bride, it’s inconceivable. But the truth is that poor performance is, like most things, in the eye of the beholder. We are often judging someone based on an implicit set of expectations that we’ve never made clear. And it’s only when we make those expectations clear that everyone can get on the same page. But if things were that easy, they’re be no point writing this article. It could be way shorter simply by saying, “just make sure everyone knows what the expectations are.” In reality, it’s more complicated. If someone were not doing well at work, and I found out they were sick, or dealing with a serious issue like the health of their child, I’d likely have empathy and give them a little space. You’d probably do the same. Right? But when we see someone struggling at work and we don’t have additional context, it’s easy to get frustrated. This is because we can’t see, and others can’t explain, issues of motivation or decision-making. Imagine that one of your employees is motivated by praise. Let’s further imagine you’re motivated internally by a drive that keeps you going without external praise. It’s hard to step out of your own perspective to understand that the challenge for that employee is finding the motivation to push thru the obstacles in front of them. Imagine that you’re the kind of person that makes decisions quickly, with whatever data you have at your finger tips. It’s hard to get yourself into the mindset of someone who doesn’t want to make a mistake and therefore delays a decision so they can gather more and more data. What do you do when staff are underperforming? It feels strange to write such an obvious statement but one of the first steps I take when anyone is having trouble is to sit down and have a direct conversation with them. Face to face. It doesn’t help any situation to try to work around the challenge. That said, I did know one manager who figured out how to get every underperformer off his team. Consistently. It was kind of amazing – even if it was super frustrating to the rest of the leaders in the organization. He just never wanted to have a tough conversation. Unfortunately, as you can guess, his job was the next one that was on the line – simply because he never wanted to have an honest conversation with anyone. Having a direct conversation does one very important thing: it resets the lens thru which the employee is thinking about and seeing things. You can imagine if that employee needs to take their kids to the doctor on a weekday morning. To them, it’s not a big deal. But equipped with this new lens, they may decide to get help or reschedule an appointment – simply because they understand that others may see the situation differently. At that point, with answers to those questions, we become partners in trying to work together to help them succeed and shift the narrative. This will get us going on delivering high performance again. What are the causes of underperformance? I’m sure you have your own list of what causes people to underperform. But I want to bring a particular one to your attention. I once worked in an organization filled with entrepreneurs. We were a start-up and each of us was wearing tons of different hats. We loved the fast-pace of the work we were doing. Every day was different. Every situation brought a rush of adrenaline with it. Then we hired a guy who came from the corporate world. I think I can honestly say that he didn’t understand us and we were completely befuddled by him and how he worked. In our books he was a clear underperformer. He moved slowly. Deliberately. And he worked way less hours. Right before it was time to start talking about whether we’d made a poor decision, we gathered to review all of our work. We had these cool charts that showed every employee and the number of calls, meetings, emails, and deals we’d each worked on. We were trying to bring a new technology into the US market and it meant we were all software developers and all business developers at the same time. Some of us had deep technical experience. Others not as much. And the guy we’d recently hired – almost none. But when we looked at his chart, there were no meetings, and no emails. In every sense of the words, he was a poor performer. Until we looked at the phone call chart. On average we were making 10 calls a day. He had made more than 150. Per day. While working less hours. And he had doubled our deals he was working on. 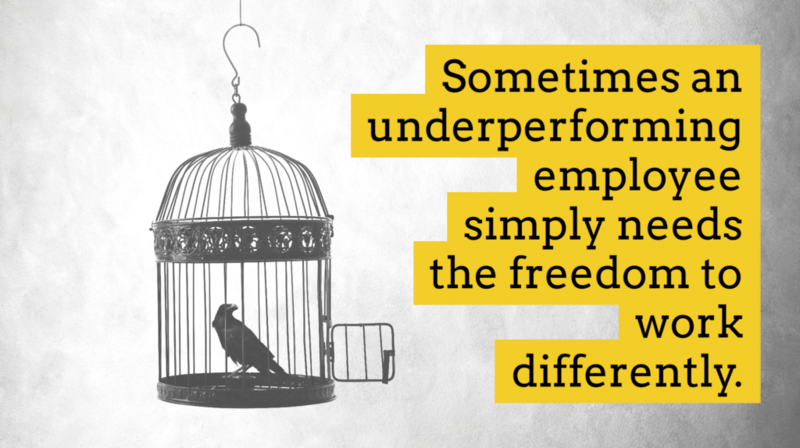 Sometimes an underperforming employee simply needs the freedom to work differently. Now I’m not saying that all poor performance at work is subjective and in the eye of the beholder. But I am saying that sometimes the poor performance is based on the ruler we’re using. And sometimes we need to change the ruler. How do you turn around an underperforming employee? I’ve told you my two questions. I should also highlight one of my mantras: I won’t harder at this than you. It’s important that I tell this to a poor performing employee because I need them to know that while I’m helping them improve, and that I want them to win, this is still something they have to take ownership of. I can’t work harder and care more about their success than they do. Sure, I’m invested in them doing well, but that’s no excuse to let them approach this casually. I invite them to work hard. I invite them to meet regularly to collaborate on how to improve the situation. But they’re driving. I’m in the passenger seat. That’s the only way this will work. So how do you turn around an underperforming employee? Let me know on Twitter.